The flea market of mondo-horse. 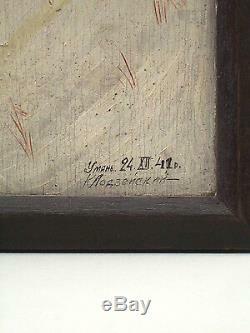 Oil painting on birchbark framed signed in Cyrillic alphabet. Made in yman and dated 1941. This Moldovan artist was known in Soviet times, especially as a director and theater director in Chisinau (Kishinev) in the Moldavian Republic. He was also illustrated by some paintings. 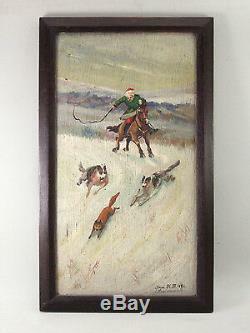 This one represents a horse rider, a fox hunt, with his dogs. It's very thin, and the bark of birch, with its slightly apparent texture, gives a very particular atmosphere to the painting. 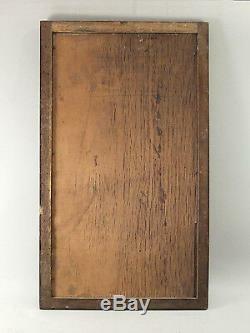 The small brown beveled frame, of origin, very sober, puts in value well the image. A great find for horse lovers, Eastern European and art history in the former Soviet Union. Size: 46 x 26 cm. Thank you for your visit. And do not miss to go for a walk in the shop. 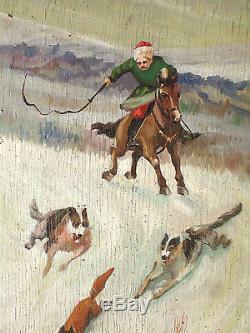 Keywords: horse, horse, pferd, equestrian, equestrian, painting, kunst, art, horse riding, horse-riding, hunting, fox hunting, cccp, moldovia, ostalgia, equestrian antiquities, equestrian decoration, gift for rider. The item "Original painting, I. Lodzejskij, lodzeischi, urss, 1941, Moldavia, horse" is on sale since Wednesday, March 22, 2017. It is in the category "art, antiquities \ art of the twentieth century, contemporary \ paintings ". The seller is "mondo-cheval" and is located in / lyon, rhône-alpes. This item can be delivered anywhere in the world.